The 1900-square foot Guest House at Bourbon Manor offers a total of 3 guestrooms: Magnolia Maiden, Debutante’s Dream, and Scarlet Starlet. 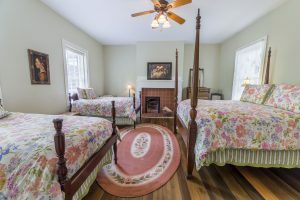 Combined, these guestrooms and the shared gathering room (kitchen and den combination) are an ideal vacation rental option in Bardstown KY, just 30 minutes outside the greater Louisville area. Built in the early 1800’s, the Guest House offers a vintage private bathroom with claw-foot tub and shower combination in EACH guestroom. A shared, gathering room which offers a kitchen/den combination, for dine-in options, beverage station, mini-frig and microwave oven. This bonus room large enough for games, cards, and socializing. A private deck offers additional space to relax with views of our gardens and grounds. Our complimentary Wi-Fi service and Cable with FREE Movies are available throughout the Guest House. The Debutante’s Dream is not only named for the bourbon-based drink, but it is also an apt description for our charming plantation home guestroom. Whether young or old, ladies love this room in our private guest house for weekends and vacations with their friends. With one queen-size bed and two twin beds, the room is perfect for small groups traveling together. Here, you can enjoy each other’s company and have some lively fun in your own private accommodations. The entire Guest House may be rented out for completely private accommodations for up to eight total guests.